I'm back with another addition to my new series here on Edible Sound Bites called Great Grains! Today the spotlight is all on Buckwheat. If you're new to the series I'm basically creating a beginners guide to gluten free whole grains. So far I've tackled millet and followed up with a recipe for Millet with Butternut Squash and Kale, which was absolutely delish if I do say so myself. I am planning to do more than one recipe per grain in case you're wondering. Hopefully I can get a nice little collection going for each of the "grains". Buckwheat is a nutritious and energizing wheat free grain, which makes it an excellent choice for vegans, vegetarians and those who are sensitive to wheat and gluten. It's also a delicious alternative to the traditional a bowl of porridge made with rolled oats. 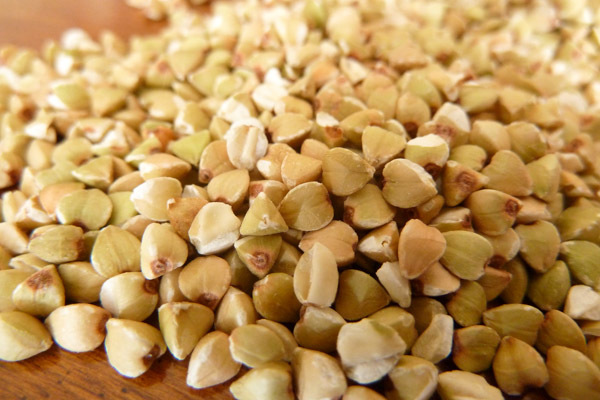 Buckwheat may sound like a cereal grain but is actually a fruit seed. The raw groats are hulled and triangular in shape. They have a delicate nutty flavour and are very crunchy to eat. Toasted buckwheat groats, also know as Kasha, are different from the raw buckwheat groats, because ...you guessed it they're toasted. You can tell the difference by looking at the colour; raw groats are soft white with a slight greenish tinge (like you see in the pictures in this post), where's toasted groats are darker brown. I don't recommend baking with them or grinding them into flour. This is just a personal preference. 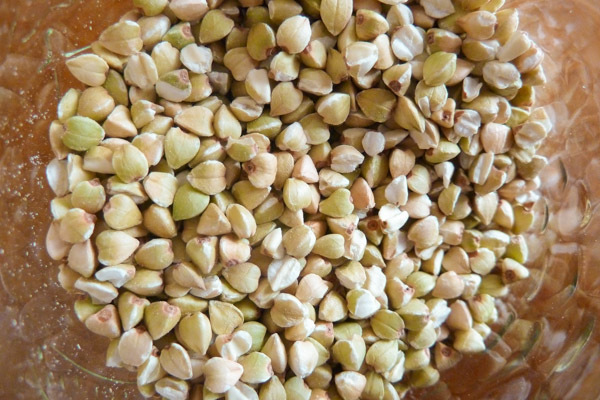 Buckwheat is one of the best sources of protein in the plant kingdom. It's also a complete protein that contains eight of the essential amino acids. Now you know why it's a favourite among non-meat eaters. It also satisfies hunger, unlike refined breads and white flours/starches. It's a very good source of minerals including manganese, magnesium, and copper. 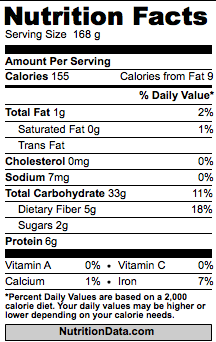 A one cup serving (cooked) contains 86 milligrams of magnesium. That's pretty good considering the RDA for magnesium is between 310 to 400 mg per day! If you're reading this thinking, "why should I care about magnesium and what the heck is it anyway", it's actually said to help lower blood pressure by improving blood flow and nutrient delivery within your body. How's that for a healthy heart? Don't forget the fiber. This super-grain boasts 5 grams of dietary fiber for 1 cup cooked/1/4 cup dry. Buckwheat is rich in flavonoids rutin and quercitin. Without getting too in-depth here, flavonoids are plant based compounds with powerful antioxidant properties that reduce inflammation, prevent and repair cellular damage, and promote healthy arteries. Naturally they come from fruits and veggies, but they're also found in tea, dark chocolate and red wine. Yippee! You can buy raw Buckwheat groats online here. And of course you'll find them at your local health food store and even some of the larger grocery stores like Whole Foods and Zehrs Markets. Just like we did with millet, first rinse the grain under cold running water for about 30 seconds to remove any dirt. Then add one part buckwheat to 2 parts boiling water. Return it to a boil, reduce the heat to a simmer and cover for 30 minutes or until the water is absorbed. This is the basic cook like oats method, but there are other ways of cooking buckwheat as well. Check out Ashley's buckwheat bakes over at The Edible Perspective. Her Cinnamon Buckwheat Bake is one of my faves. The raw groats can be cooked like rice and millet and then used in salads and side dishes. Grind in your food processor or coffee grinder (for small batches) to make your own flour. You can buy buckwheat flour, but I find the taste to be a little strange. I prefer to grind it fresh when I need it. Fresh is best! It's a great alternative to other flours in both quick and yeast breads. Perhaps this is why pancakes seem to be the number thing made with it. They make a wicked bowl of porridge. It's a great substitute for wheat and oats. Use them as the base grain for pilafs instead of rice. I can guarantee I'll be doing a lot of experimenting with it in the baking department. Be on the lookout next week for a buckwheat recipe.